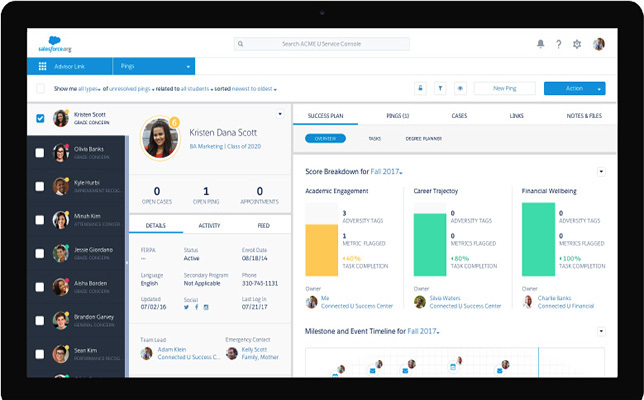 In an effort to assist academic advisers, who often oversee outcomes for hundreds of students at once, Salesforce is introducing a new tool that delivers a holistic view of each student’s academic experience. Salesforce Advisor Link is a mobile advising application built on top of Salesforce’s CRM. With the app, advisers “can scale their impact, build trusted relationships and focus on keeping every student on track to graduate on time. Students will be able to connect with advising community in one place, schedule appointments and ultimately see how they are progressing in their journey,” according to the announcement. Salesforce will launch the app in 2017. Anyone interested in staying informed on the development process can fill out the form for Salesforce’s Success Collective on the Salesforce Advisor Link site.